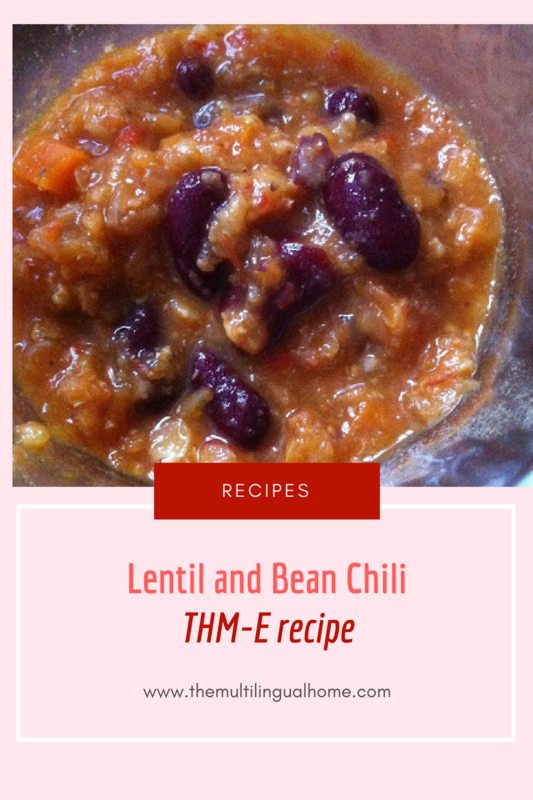 As I was planning my meals for this week, I noticed that it would be rather chilly and rainy, so I was looking for an easy to make, quick THM-E meal for dinner. I find E meals are often rather hard to plan or make because I don’t really see much variety in the options so I scoured the internet for different recipe ideas. 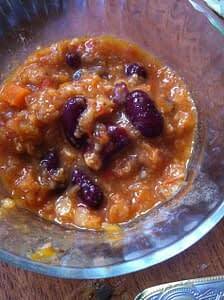 I found this recipe from Darcie’s dishes for Two Bean and Lentil Soup and after debating about what to put in, I decided to make a chili inspired by this recipe. You will find the recipe and instructions below. We served this with elbow macaroni for kids or pregnant women like me. Share with your whole family there is bound to be lots of leftovers so freeze it for another meal. Add the first set of ingredients (onions, celery, carrots, pepper and oil) to a thick bottom soup pot. Cook for 5 minutes on medium high heat. Add the pepper or tomato paste and the diced garlic to the pot and stir often to make sure the paste doesn’t burn. Add the spices. Add the rinsed beans and lentils to the pot and mix well with other ingredients. Add the tomatoes and the hot water and bouillon cube. Add salt and pepper as needed. Stir well, allow to boil and then let simmer for 20 minutes. After about 20 minutes, take out half of the chili and blend with an immersion blender or blender. Put the blended chili back in the pot and simmer for another 30 minutes. Taste to check if salted needs to be added. Stir occasionally because the chili will be lumpy. Add extra water if needed. Serve while hot with a little sprinkle of cheese and elbow macaroni as needed. Enjoy! Please comment if your significant other or picky eaters enjoyed this meal.